Last Sunday, sitting in a deep felt seat in the newly refurbished VUE just off piccadilly (in one of those pleasingly steep galleries) - I got a chance to do just that. I was there to see ‘Day of the Flowers,’ an off-beat British indie about two Glaswegian sisters in modern day Cuba (though more about that later). As part of the ticket I had been emailed a copy of the shooting script. Consequently, as the film was beginning I already had the whole story and all the characters in my head (as intentioned by writer Eirene Houston). All that remained was to sit in the dark (with a coffee) and see how the scenes had been brought to life by director John Roberts; the casting choices for the characters; the editing decisions; the locations.. in other words everything which makes movies the complex and fascinating creatures that they are. 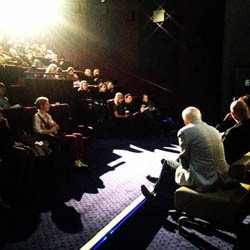 The audience were primarily scribes, producers and fellow film enthusiasts - all part of the London Breakfast Club run by Chris Jones. The Day of the Flowers is a road movie spent in the company of a couple of engaging characters; told from a refreshingly male-free perspective (here it’s the guys who do the ‘supportive girlfriend’ role). After the credits rolled, the stage was given over to John Roberts (director), Eirene Houston (screenwriter), Vernon Layton (DOP) and Jonathan Rae (producer). Vernon Layton quickly dispelled notions of the crew sitting around and enjoying sunsets and mojitos; replacing them with tales of bad food and post-socialist bureaucracy. Eirene Houston expounded on the evolution of the script: from an idea she had after visiting Cuba; through pre-production discussions with the director; to re-engineering scenes on-set. John Roberts (with the look of a war veteran about him) told us about the challenges of filming in Cuba, with its continuing antagonistic relationship to the US and its film industry. Jonathan Rae talked us through the importance of a collaborative relationship between producer and director. What came across particularly was the difference made by having a well known actor on your poster; in terms of the film’s distribution chances and over-all commercial viability. Translated in audience terms: there are dozens of excellent films we will probably never see because they don’t have Keira Knightley and Daniel Radcliffe; likewise, many terrible ones which we will because Sean Bean is in a supporting role (a major improvement though this may be). -If you’re a director - it’s important to find a producer that you get on with well (and can have arguments with). -Having a famous actor in one of the lead roles will literally mean your film is shown in more cinemas. -Even if you write an excellent scene, you should still cut it if it throws the story out of balance. -Writers: your script will evolve right until the start of principal photography, and will most likely continue to do so until the end of the shoot. -Producers: you are the Nike advert. Just do it. -Guerilla style film making is not easy in a country that perfected Guerilla-style tactics. As is traditional, the occasion ended with a trip to the pub, and a chance to have a pint or two with cinephiles and film makers alike. In the end, what I took away with me was this: as long as there are dedicated men and women out there producing films like this- the British Film Industry is doing great, thank you very much. Cinematic lifestyle ! Love it. Having read this I believed it was rather informative. I appreciate you taking the time and energy to put this article together. I once again find myself personally spending a lot of time both reading and posting comments. But so what, it was still worthwhile! Hi there! This post couldn't be written any better! Looking through this article reminds me of my previous roommate! He continually kept preaching about this. I will send this information to him. Pretty sure he will have a very good read. Many thanks for sharing!